During the first four years our family lived in the Westcott neighborhood I barely noticed the neighborhood runners. The only time they caught my attention was when weather was particularly hot, or cold, or wet. I’d see a lone jogger trudging up the big hill on Euclid as it snowed and I’d shake my head and wonder what possessed a person to do something so crazy. Two years ago, after a lifetime of being aggressively unathletic, I became one of them. I’m still unsure what made me start, and then what made me keep going. But, believe me, if I can become a runner anyone can. My relationship with the neighborhood has become much more intimate since I became a runner. Watching the rose garden at the house on the corner of Meadowbrook and Bradford explode into bloom as the summer progresses. Remembering which trees will change color and drop their leaves before the others along the bike path in Barry Park. Keeping track of what potholes develop over the winter and then get fixed during the spring. Realizing the hill along Colvin past Buckingham is much steeper than I thought, at least the first half until you reach the entrance to the soccer field. But my favorite part of running is the people. I don’t know their names, have never spoken to them beyond an out of breath hello, or a quick wave of the hand, but my fellow runners bring me so much joy during the difficult slog of getting in my miles. There is the lady who is about my mom’s age, slow but steady. She is out all year long, no matter what the weather, with an enormous grin on her face. If I get out the door close to 7 AM a pack of the SU runners blow by me on their way to their daily group run at Barry. Their effortlessness delights me. It might also make me a bit jealous. The gentleman in the white t-shirt and gray shorts. I used to see him constantly, but our running schedules have shifted away from each other. The other week I spied him mowing his lawn on Fellows and had the crazy urge to run up and thank him for encouraging me just by being out there everyday two summers ago. The first race I ever participated in was right in the neighborhood, our own Festival of Races. Last year my kindergartener managed to run about half of the 3K Family Run, as part of the Ed Smith Elementary team. 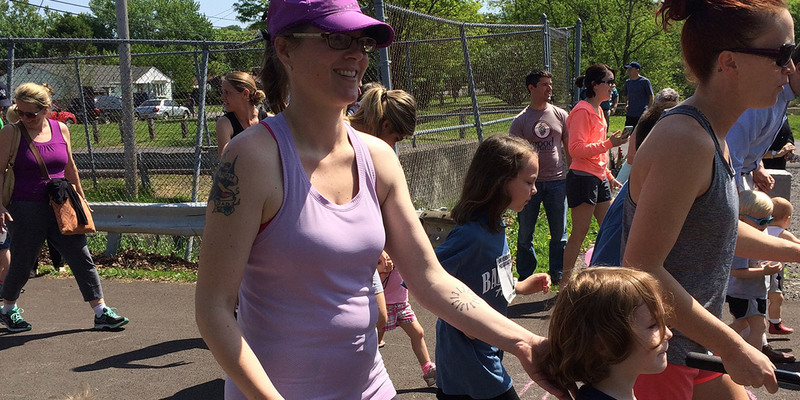 Our family had a blast at both of the Barry Park Fun Runs, a tradition we hope to continue for many years. Although next spring I’m hoping my youngest runs the whole thing himself. Even a quarter of a mile is a long way to jog with someone on your shoulders. If you are interested in trying out a local 5K, the Festival of Races will be held Sunday, October 4th starting right over on Colvin. If you are looking for a longer run the Empire State Marathon and Half Marathon will be held on Sunday, October 18th at NBT stadium. I’ll be the one in the purple Nike hat, probably taking all 7 hours available to complete my first marathon! If you see me please say hi! And if you finish up a run near Westcott Street and need to rehydrate there are plenty of choices in the soda/sports drink/water department at all the convenience stores and restaurants. But if you are like me, only an icy can of Coke will do. Not a bottle, not a Pepsi, a single can of Coke. And I can tell you from experience the only place to get one on Westcott is at The Westcott Grocery for a cool 75 cents.